Julia graduated from the University of Bristol Veterinary School in 2006, then spent three years in small animal general practice. In 2009 Julia worked as a cardiology intern at SCVS, then completed rotating and cardiology specialist internships at the Royal Veterinary College. Julia started her residency in Small Animal Cardiology at the RVC 2011 during which time she also completed a master’s degree in veterinary medicine and was subsequently awarded her American Diploma in Veterinary Cardiology. 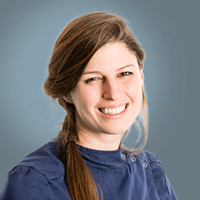 Julia has a particular interest in advanced cardiac imaging and arrhythmias. She is very happy to have returned to Hampshire to re-join the team at SCVS.